DNA is certainly the basis of life. Soon it might also be the basis of your electronic devices. A Northwestern University team has developed a new set of design principles for making photonic crystals akin to the ones that are typically used in computer, television and smartphone displays. By using synthetic DNA to assemble particles into crystalline lattices, the researchers have opened the door for much lighter and thinner displays compared to what is currently available. "Most people look at a laptop display every day, but few people understand what they are made of and why," said George Schatz, Charles E. and Emma H. Morrison Professor of Chemistry in Northwestern's Weinberg College of Arts and Sciences. "One component of the display is the back-reflector, a mirror-like device that directs the light emitted by the LCD to the viewer. These reflectors are made using layered polymers that are much thicker and heavier than our crystals." Northwestern's approach not only replaces these polymers with gold nanocrystals but also spaces them apart to leave air among them. The result is a lighter, more compact, precisely designed and reconfigurable structure that is still highly reflective. The research was published online yesterday in the Proceedings of the National Academy of Sciences (PNAS). Schatz and Chad Mirkin, the director of Northwestern's International Institute for Nanotechnology and the George B. Rathmann Professor of Chemistry, served as the paper's co-corresponding authors. 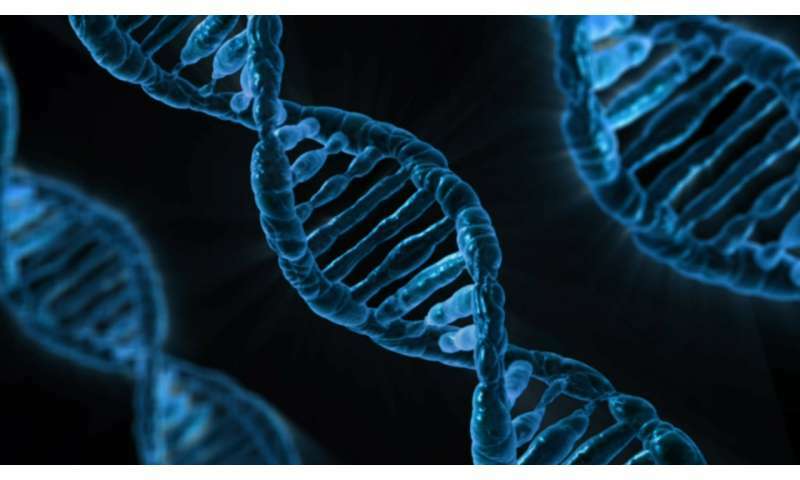 Although DNA is almost always associated with living organisms—from simple bacteria to complex humans—the DNA used in the study is chemically synthesized and manipulated rather than derived from living cells. In 1996, Mirkin invented ways to link synthetic DNA to gold nanoparticles to produce new materials not found in nature—to essentially use the "blueprint of life" to program their formation. These structures have become the basis for more than 1,800 globally used products, primarily in the life sciences. Then, in 2008, Mirkin and Schatz collaborated to make crystals from particles linked by DNA. By attaching strands of synthetic DNA to tiny gold spheres, the duo found they could build three-dimensional crystalline structures. Changing the DNA strand's sequence of Gs, As, Ts and Cs changes the shape of the crystalline structure, allowing the researchers to arrange the particles differently in space. More than 500 crystal types, spanning more than 30 different crystal symmetries have been made using this approach, making it a powerful and fundamentally new way to program the formation of crystalline matter. Despite making sophisticated advances with this work since 2008, Mirkin and Schatz did not initially realize that the crystal lattices they made in the laboratory had optical properties similar to the polymer layers found in device displays. "Through computer modeling, we realized by accident that the crystalline materials with gold nanoparticles had properties that we missed earlier in the work," Schatz said. "We then optimized the optical properties using computations, and these demonstrated that the non-touching metal spheres could, in some cases, be better than the touching polymer spheres." After making the crystals in the laboratory, Mirkin's and Schatz's teams measured the crystals' optical properties to find that their computational modeling was indeed correct. Although they only tested the crystalline lattice's reflective nature in the current PNAS paper, the method could lead to many types of functional "designer" materials using DNA-driven self-assembly. "The generality of the approach and the design rules are quite extraordinary and independent of particle composition," Mirkin said. "This takes what we initially conceived in the 1990s to entirely new heights."